Given the atrocious rise in recent acts of poaching, clearly committed by persons from Mozambique, against South Africa’s precious rhino – and last week, an elephant cow from Tembe Elephant Park – it is now imperative that South Africa’s parliament acts quickly and decisively to stem this ‘bloody’ onslaught. Since your portfolio committee acts as our custodial legislative oversight body, we are writing to you, directly – as an open letter, published via social media – in this grave matter. Earth Afrika is an informal alliance of NGO’s, conservationists, ecologists, environmental lawyers and active citizens, both inside South Africa, and across our region. 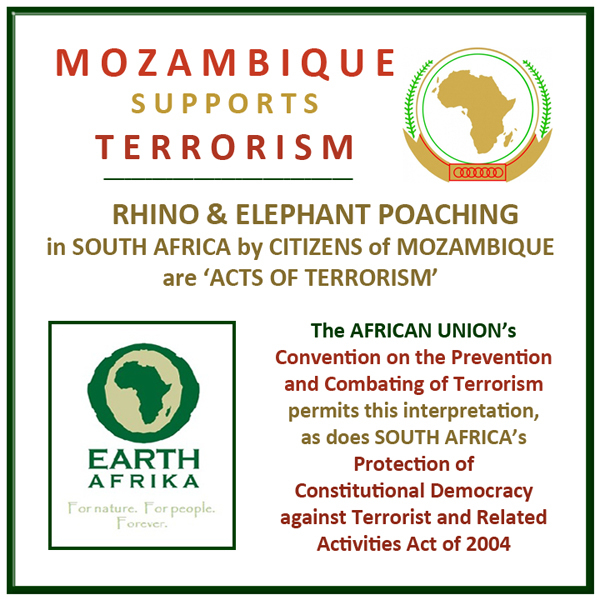 Our legal and legislative research confirms that poaching activities and related wildlife crime may be deemed “Acts of Terrorism”, as interpreted within the context of both South Africa’s own Protection of Constitutional Democracy against Terrorist and Related Activities Act (Act 33 of 2004) and the African Union’s Convention on the Prevention and Combating of Terrorism, as defined by the former Act. Accordingly, we draw your esteemed attention – and that of your oversight committee – to this extremely critical matter of national security, by way of some brief background information and a suggested ‘action plan’. The AU’s Convention – signed and ratified by both SA and Mozambique a decade ago, and formally lodged with the United Nations after adoption – is a primary guiding, multinational instrument, recognized by our own legislation. 4. The Department of Water and Environmental Affairs, in conjunction with SA National Parks and other provincial parks, can more than adequately prove to your committee that a significant part of our poaching crime originates from Mozambique soil, and that this respective “State Party’s” government has neither enacted laws, nor taken strong law enforcement counter-measures, to recognize our national, African and global assets and these appalling threats to their future security, as well as our resultant national economic and “war” crisis. (b) The Republic of South Africa has neither applied its mind diligently, nor taken strong corrective action, to halt such “terrorist” incursions from Mozambique on our national soil, thereby creating a national security crisis, and must insist – with immediate effect – the SA Police and National Prosecuting Authority give effect to charging parties of such a “terrorist” crime, once apprehended. 6. Direct South Africa’s law enforcement agencies to give substance to these “terrorist crimes” immediately and also make national statements to our citizens about the gravity and new focus of such crime prosecutions. Sir, whilst we are clear in our firmly held opinions in this matter, we are acutely aware of strong historical ties with our SADC and African neighbour. Hence, whilst firm, we tender this open letter with due respect, given the gravity of this prevailing situation. Additionally, whilst we are acutely aware that poaching is not singularly linked to multinational, criminal, terrorist gangs emanating from Mozambique, there is a plethora of evidence that this nation plays host – wittingly or unwittingly – to the majority of this costly and ‘bloody’ threat to our national security and our rich natural treasures. Thus, we call on you, and your committee, to consider – in serious terms – the substantive summary of opinion and proposed action plan contained herein. Thank you for your attention thus far. This is exactly what is needed..thank you. Pottie – thanks for your comment here, but I’d prefer that this post stays very focused on poaching alone. When one introduces side-issues – such as police brutality, etc – then issues get very conflated and the right people don’t listen, or they get irritated at being drawn into unrelated arguments. I agree..thanks again for the information..a very good article.